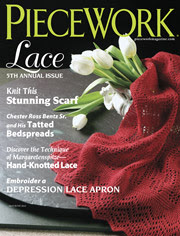 The latest issue of Piecework arrived in my mailbox today! It is the 5th Annual Lace issue!! There is an absolutely exquisite Russian Triangular Butterfly Shawl, designed by Inna Voltchkova, to knit. I think this has to be one of the most beautiful pieces of lace I have ever seen! If you have been reading my blog for a while, you may know that I am not big on large projects - and this would be one of those large projects. However, I may just have to make an exception. This is so beautiful! Also in this issue, Bucks Point Lace article with a Bucks Point Bobbin-Lace Edging to Make, by Jo Ann Eurell. Reticella Needle Lace to Stitch, by Bronislava Bacilkova. A Lacy Ribbonwood and Fern Scarf to Knit, by Margaret Stove. Margaretenspitze (Margarete's Lace), which is a type of hand-knotted lace - article as well as a tutorial on the technique and a flower project, by Marji Suhm. There is a lot more lace goodness in this issue, so if you love lace, be sure to get your copy! Hi everyone! It's certainly been quite a while since I did a show. Now that the weather is warmer, I can sit outside to record. I recently went to Hobby Lobby for the first time. I loved their selection of knitting books, and while I typically do not knit with acrylic yarn, they did have some nice yarn also. There were a few I liked, but in the end only got a few skeins of Andes Alpaca by Yarn Bee, in the color Camino. I have decided to make my first top down shawl with this yarn. I also got two pairs of rosewood needles - one having an inlay of mother of pearl on the top. As you all know, I love my Addi Turbo neeldes, but am quickly becoming fond of the rosewood needles! This is my latest pattern, which is available for purchase on Craftsy. 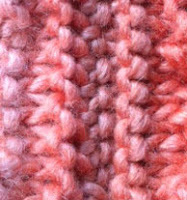 This is a quick knit, using Lighthouse Waves yarn featuring the Acorn Cable stitch. Even if you have never knit cables before, this is an easy stitch. 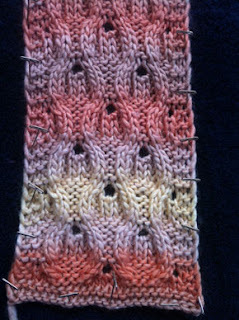 There is also a video tutorial of the stitch incase you need help with it. I know the weather is beginning to warm up, and probably the last thing on your mind is making something to keep you warm. The mornings and evenings are still rather chilly, and a little warmth around your neck can help keep away the chill. Also, a lot of offices crank up the AC in the summer, and a cowl is nice to help keep the air off your neck. And of course, if you make it now, you can have it ready to go when autumn/winter returns. I've told you before about using those nifty little plastic bags that bras and bed sheets come in to take along a small project when you go on a trip, etc. I recently purchased some sheets which came in a nice little cloth bag. The extra pillow cases also come in little bags, which are perfect for a small project, needles, a few notions, and a copy of your pattern. I love these! They are soft, pretty and just the right size for carrying along where ever you go! I got mine at Walmart, but I am sure you can find them in any store that sells sheets. You asked, and now you will receive! An overwhelming majority of you voted to have longer videos demonstrating cable and lace stitches. I will still be doing the shorter, less complicated stitch videos, but now will also be including longer videos too. You can find all of the stitch videos over on The Weekly Stitch. That is going to wrap it up for now. You can find me on Facebook and Twitter. Mostly on Facebook, Twitter is just for when I put up a new video or pattern mostly. Feel free to send any questions, comments or suggestions to sapphiresnpurls at gmail dot com. This is my latest pattern. I chose the name because the colors of the yarn remind me of the beautiful fall colors, and the acorn cable stitch pattern I used. You are, of course, free to use any color of yarn you like! Gauge is not critical for this pattern, and feel free to substitute any other medium weight, similar yarn if you are not able to find the one I used. 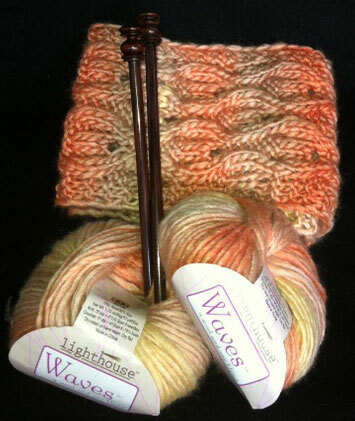 This pattern uses a yarn called Waves, which is a 70% wool / 30% soy blend. (Same as Patons SWS, which has been discontinued). This is a fairly quick knit, and great for keeping the chill away. You can purchase the pattern over on Craftsy. Here are some pictures of the blocking and seaming done on the cowl. 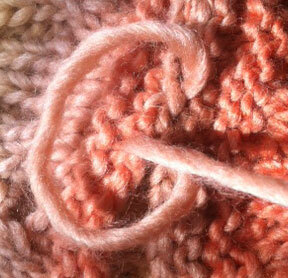 Blocking is optional, but I do recommend it to open up the beautiful cable stitch pattern. You don't need anything special to block the cowl. I just pinned mine onto a towel on the bedroom floor. Just be sure you have a place that is out of reach of toddlers, cats and any other curious creatures. 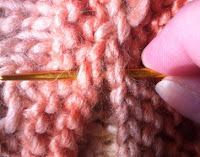 For the seaming up, use any method you like. I like to sew under the stitches of the cast on and bind off edges, and pull the needle up through the loop of the yarn on the needle. This makes a firm seam that is nice and neat. Here are the pictures, and there is also a video demonstration of the Acorn Stitch over on The Weekly Stitch, incase you need some help.